It’s difficult for a team to build momentum early in a season when it has proven that it has little ability to hold leads late in games. 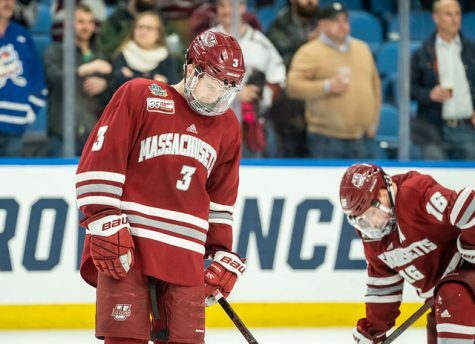 The Massachusetts hockey team seems to take its foot off the gas pedal, so to speak, in the third period during most of its games this season. 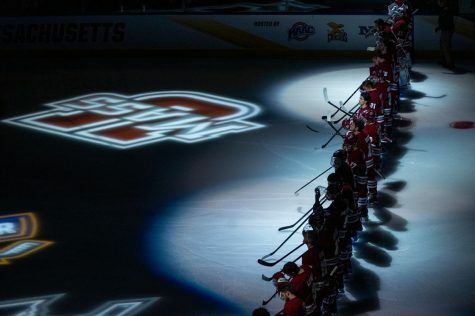 UMass has blown leads on three different occasions through only six games this year, two coming last weekend in a home-and-home series with Hockey East foe Boston University. The Minutemen (1-3-2, 0-3-2 HEA) will get back to work starting Friday when they go on the road to take on New Hampshire. UMass will conclude this week’s play the following night when they host No. 1 Boston College for their second game against the Eagles this season. 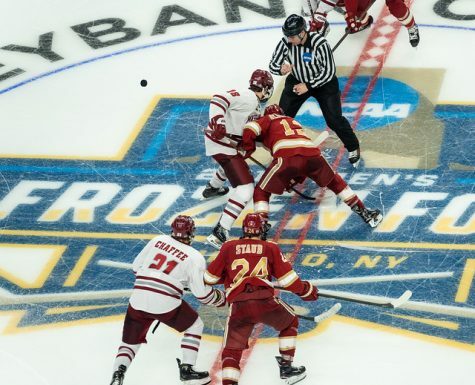 Last Friday, holding a 2-0 lead late in the second period, the Minutemen surrendered a late goal to BU’s Matt Nieto, followed by another just five minutes into the third. The following night, on the road holding with a 3-0 lead through the opening period, the Terriers netted four unanswered goals to take a 4-3 lead with about eight minutes left in the third period. The Minutemen were able to tie it up, but they ultimately fell in overtime – a game in which they had a significant lead on their opponent. 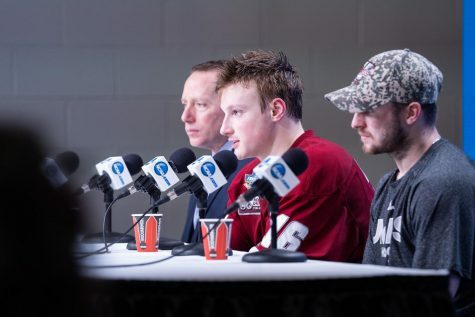 “It was a quiet bus ride home [Saturday],” said UMass coach Don Cahoon. “[Getting the fourth goal to tie the game] doesn’t take the sting away from the result … we’re angry about it, because something has to give here for us to be able to control these situations better. 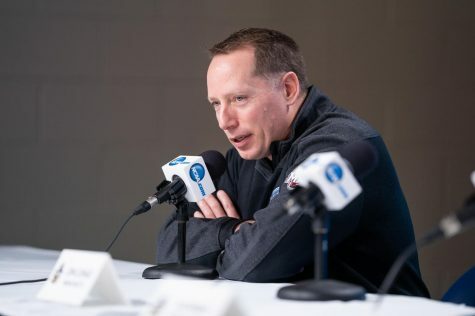 Cahoon also said he noticed an improvement in stick penalties last weekend, namely that they didn’t occur as much as in previous games, as the team learns to play with better positioning. 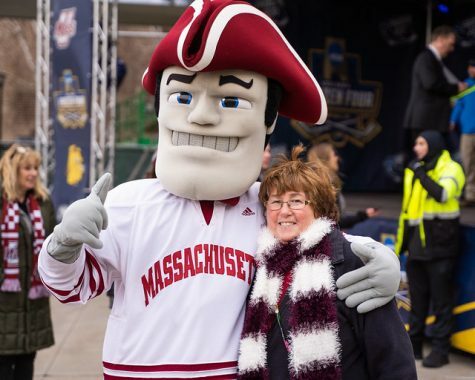 For perspective, UMass does not bode well against Hockey East opponents. The Minutemen have gone 10-79-8 against the Huskies (2-4-1, 1-3-0 HEA) all-time. The squad has seen some trouble against the Wildcats, as well – with the last victory coming back on Nov. 11, 2009, in a 4-3 overtime win at home. The Huskies rank near the bottom in most team statistics in-conference this year, including ninth in scoring offense (2.29 goals per game), scoring defense (3.86 goals allowed per game) and dead last in goals allowed (27). On the other hand, BC should prove to be a handful. Not surprisingly, the top-ranked Eagles rank near the top in most categories in the HEA. With the departure of four-year starter Paul Dainton following last season, the Minutemen have flip-flopped players in and out of the starting position between the pipes thus far this season. Despite getting playing time last season, sophomore Jeff Teglia has had to battle to earn every minute he can get. Freshman Kevin Boyle has raised eyebrows with some impressive play, given the fact that he’s been thrown right into the mix early on. 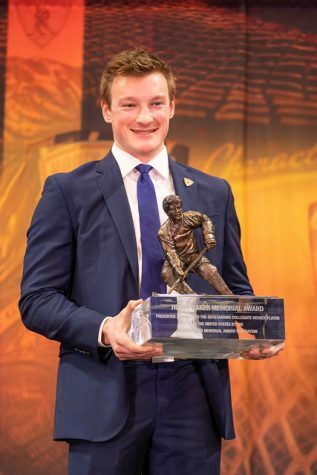 “Once you get out there … it’s just smooth sailing,” said Boyle. He’s started three of the team’s six games season, notably in the Minutemen’s lone victory this year in a 5-3 win over Bentley back on Oct. 14. 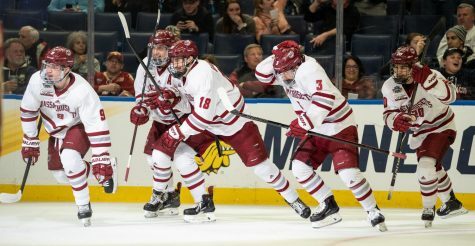 When it seemed that the team was showing signs of another free fall against the Falcons in the final frame, Boyle’s 10 third-period saves (21 for the night) allowed UMass to the hold onto its lead and win the game. Finally, freshman Steve Mastalerz is starting to practice after suffering an injury during preseason camp. Mastalerz, once he is healthy, looks to be a part of the equation going forward.